In 2007, Panini released an album of the Mexican league. The album included also 5 European teams: Barcelona (with Mexican Rafael Marquez), Manchester United (English champion), Milan (European champion), PSV Eindhoven (Dutch champion with the Mexican Carlos Salcido) and Stuttgart (German champion with the Mexicans Pardo and Osorio). The album opens with the table of content, preface, and the first sticker: the Panini logo. Then, the five European teams are shown. Each team is displayed over two pages with 16 stickers of players (no badges or team photos are included). Here we can find the young Messi, Cristiano Ronaldo, Pirlo, Afellay, and Mario Gomez. The album continues showing all the Mexican teams of the Primera Divison. There are in total 18 teams, 15 of which are displayed over three pages with 18 stickers + updates, whereas the remaining three teams (Dorados, Leon, Queretaro) have only 9 stickers on one page without updates. For each club there is a silver sticker of the club badge and the rest of the stickers are player portraits. For the last three teams there are two players on each sticker, for a total of 16 players. This album includes some gems. 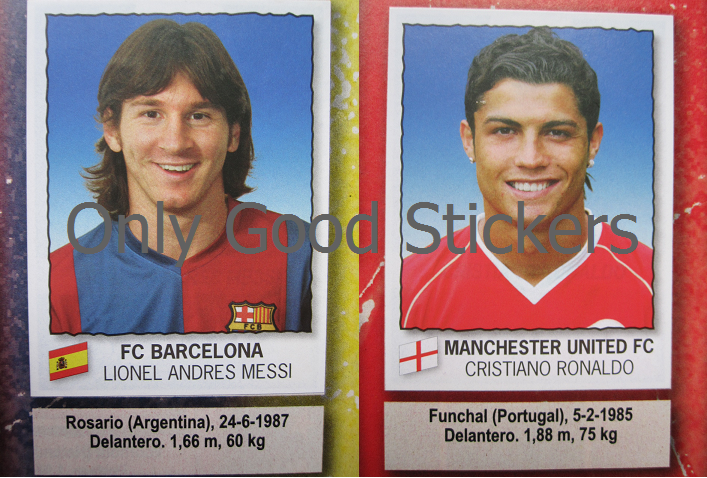 First, we find two young players that later on became the best of the world: Leo Messi and Cristiano Ronaldo have here one of their first stickers. Second, we have the first ever sticker of the rookie Javier "Chicarito" Hernandez. He was 19 years old and debutant for Chivas Guadalajara. Lucas Barrios (Atlas) had success later on in Europe with Borussia Dortmund. Here we find also the rookie sticker of Javier "Chicarito" Hernandez (Chivas, 19 years old), ex Manchester UTD now at Real Madrid. This album includes also un update section. On each Mexican team page (excluded the last three teams that have no update) there is space for 4 extra stickers. The update set ("Actualizaciones") includes thus 60 extra stickers. 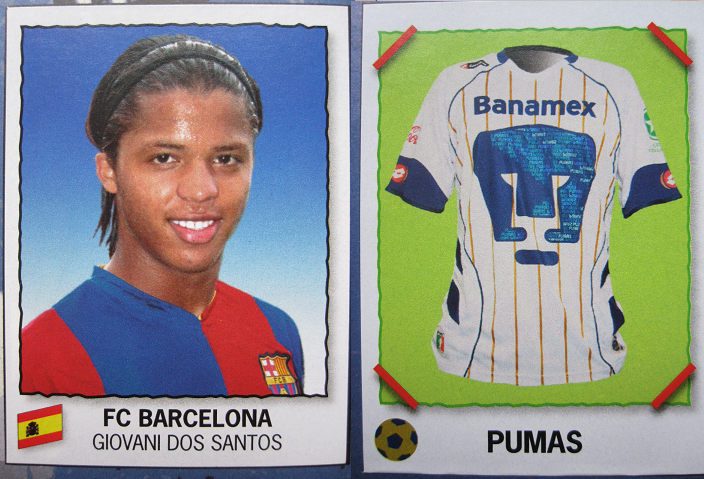 For each team there are three stickers of players and one sticker with the home jersey, with an exception: for team Puebla there is no home jersey, but instead a sticker of the young mexican Giovani Dos Santos, new signing of Barcelona.